This is Part Two in my Etsy Analytics series. Need to get caught up? Check out Part One. Now that you've installed Google Analytics for your Etsy shop, we're going to talk about Etsy's built-in Shop Stats. 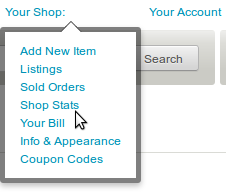 You won't need to install anything to use Shop Stats; Etsy automatically collects stats for you. Today we'll take a tour through the stats interface to familiarize you with all its features. Let's go take a look at your Shop Stats! To visit your shop's stats, go to Your Shop > Shop Stats. 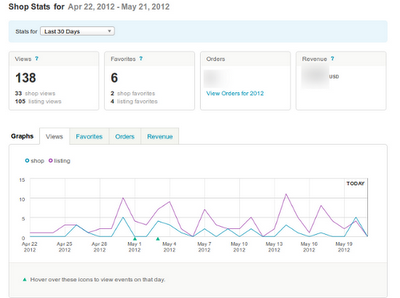 That will take you to your Shop Stats dashboard, where you can view all the data Etsy has gathered for you. On the Shop Stats page you'll find a tabbed graph. As a default the graph shows you page views by date, with general shop views separated from individual item views. The other tabs will show you favorites, orders, and total revenue over the date range you select. You can set the date range to specific dates or use one of the many date options from the dropdown menu. These Etsy shop screenshots come from a very generous client of mine who is just getting started with Etsy. She's a little shy about her newbie stats so I've blurred out or removed some identifying info at her request. Scroll down a little to see even more detail about your Etsy shop! The "Traffic Sources" column on the left will give you a general idea of where your visitors came from. You can't see specific details about linking sites, though. For example, if a blog post sent you some shoppers, you'll see the blog's domain name (example.com), but not the link to the exact post that mentioned your shop. That's info you can find in Google Analytics -- we'll get into how to do that later in this series. Moving down below the traffic sources you'll find the keywords section. You can see the search terms your visitors used in Etsy, Google, and other search engines to find your shop or your items. 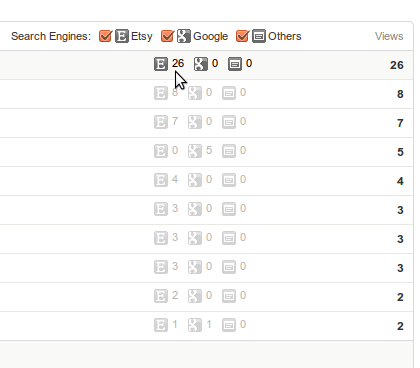 If you click on each keyword, you'll see which page(s) your visitors landed on with each search term. This access to Etsy search terms is very, very valuable. Often, internal Etsy searches drive more traffic to your shop than any other source, so it's very important to know what search terms customers used to reach your shop. Use this data to determine if you've selected appropriate tags for your products. Below the keywords section, you'll find "Pages Viewed" and "Listing Favorites". "Pages Viewed" shows you how many times your listings and sections have been viewed. Other pages in your shop, like the main page or your policies page, are counted all together as "Your Shop"; they are not listed individually. "Listing Favorites" are the items in your shop that have been favorited by Etsy shoppers. This little slice of warm fuzzy data will not only boost your mood, it can help you get a feel for which of your items might sell soon! For example, if you start to see a bunch of favorites on your Halloween bibs in September, you might want to make a few more! You can find out which treasuries have sent visitors to your store in the past 30 days from the Shop Stats interface. Under "Traffic Sources", click "Treasury" (you may need to page through the traffic sources to find it). On the resulting page, scroll to the bottom to see the items that were viewed from a treasury. Click the link for each item to view more detail. At the bottom of that page you'll see any treasury the item has been in over the past 30 days. 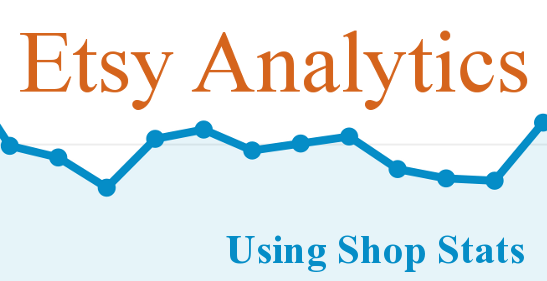 Some of the information you'll get from Google Analytics and Etsy Shop Stats will overlap, of course. But each has its unique strengths, and they complement each other beautifully. To get the best available data about your shop, you really need to use both. Here's the main thing Etsy Shop Stats has that Google Analytics doesn't: inside information about how your visitors are interacting with your items. Through Shop Stats, you can view actual sales data, which you can't track in analytics. You can also see how many people have favorited items in your shop, and any treasuries that include your items. This is a direct "finger on the pulse" of the Etsy community, and a valuable tool for determining which of your items are getting serious attention. Google Analytics is much more customizable tool, and it will give you a different perspective on your visitors and the parts of your shop that are attracting customers. We'll cover that in more details in upcoming posts. Ok, that's been a lot to cover in two days, hasn't it? Take a little break, let some data gather, and then move on to the next post, where we'll talk about measuring the traffic generated by social media, blog posts, and advertising. Want to read this series offline instead? This entire series is available in free ebook format via Readlists! Read it on your Kindle, your iPad/iPod/iPhone, or e-reader.